Spotless Cleaning Service’s Bal Harbour housekeepers and professional cleaners will work with you to give you the precise services you need. Whatever the size of your property, or the frequency of visits, we make it a priority to ensure every customer is 100% satisfied with the service they’ve received. We believe you deserve the comfort of professionally, thoroughly cleaned space, and we work to make sure that’s what you get. As part of the Bel Harbour community, we also use only cleaning products that are up to local codes and guidelines. And we don’t stop there. All of our products are also safe to the environment. We’d also like to encourage you to inform us about anyone in your home or building with allergies or sensitivities so that we can modify our formulas to ensure their safety. And if there are any other modifications or additions you’d like to request, please let us know when you call for an appointment. Our house cleaning services are the most thorough there are. We’ll leave no part of your home untouched. You can count on walls and baseboards being scrubbed, and the oft-overlooked draperies being steam-cleaned. Give us a call today to get your home into the best shape it’s been in since it was built. When you’re trying to rent or sell a property, having it cleaned is one of the best ways to expedite the process. A clean property is alluring and nice, so buyers and renters will make a choice much more quickly. And our Bal Harbour housekeepers can get your property into the best shape you’ve ever seen it in. For any vacation rentals, our cleaners can help you make the most of your time. By speeding the cleaning time in-between different renters, we’ll maximize the amount of time your space is being paid for. If you’re a renter moving out of a property, let us help you avoid fines and penalties. You’ll often be penalized for not cleaning parts of the property you’d have never noticed. But with our Bal Harbour professional cleaners, you can rest assured that you’ll be in the clear. With our industrial cleaning products, top-of-the-line techniques, and Bal Harbour team of professional cleaners, Spotless Cleaning can handle any of your commercial property cleaning needs. We’ll clean large office buildings to make sure they’re as clean as any workspace needs to be. And after construction or renovation we can handle the debris and building material. Call our team of professionals today. If you’re looking for professional maid services in Bal Harbour, we’ve got you covered! 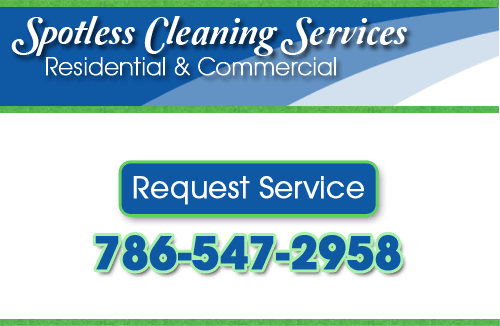 Call Spotless Cleaning Service today at 786-547-2958 or fill out our online request form.